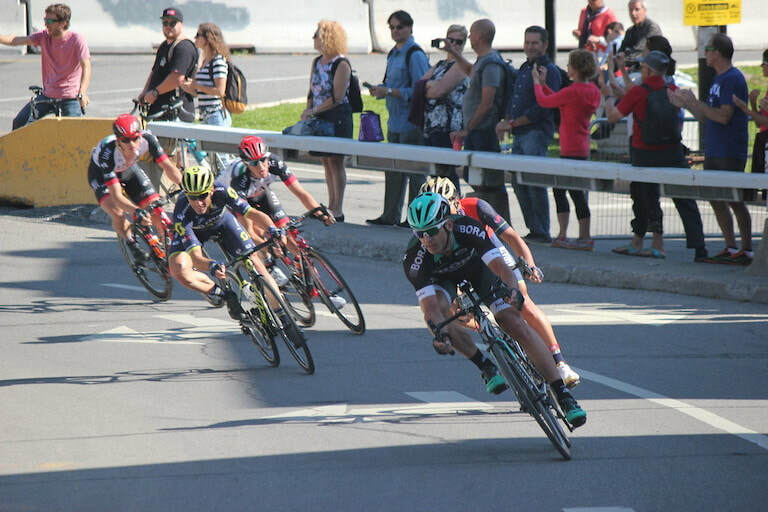 The ride from Montreal to Quebec City on Route Verte was by far the longest fixture ride of the refounded Montreal Bicycle Club for 2017. Some members only took part only in the send off portion to the Jacques Cartier bridge, Geoff hosted the club at his home in Chambly and took part in the a portion of the ride, Ian continued on to Sherbrooke and then came back by bus, and Malcolm completed the entire length, returning by train on Sunday. There are different versions of the minutes, depending on the author's perspective. 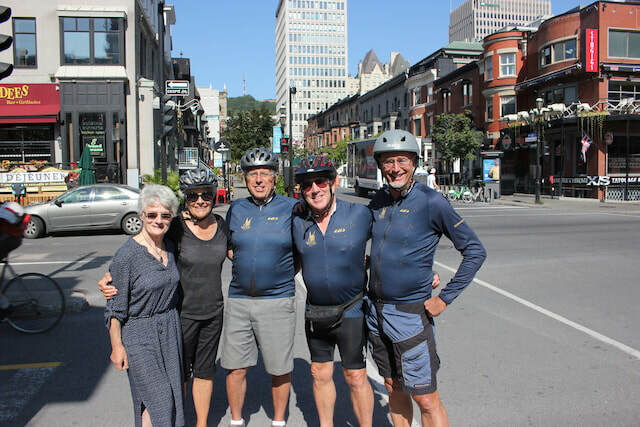 Maria, Betty and Bill provided encouragement, support, and best wishes to Malcolm and Ian on their trip to Quebec City. We bade them a farewell from the mid-span exit of the Jacques Cartier bridge as they rode off into the hinterlands of the south shore. We on the other hand did a leisurely circuit of the circuit Gilles Villeneuve then engaged the Lachine Bike path via the Concordia Bridge. We ( the mini-riders) were delighted with our outing today..
elapsed travel time 1 hour 57 minutes. The meeting began at approx 10 am August 30 with Bill, Malcolm, Betty, Maria and Ian in attendance. 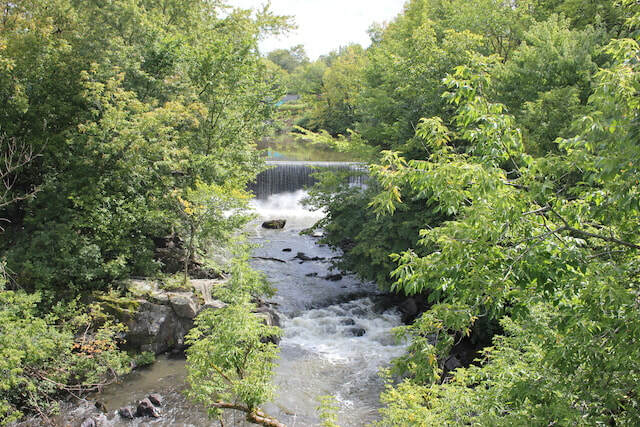 Around 11 we ventured out on de Maisoneuve toward Papineau and Jacques-Cartier bridge. At the exit to Ile Ste-Helene Bill, Betty and Maria headed to Circuit Gilles Villeneuve for laps whilst the Pres and VP ( this point may require further ratification, Editor) headed on to Longueuil, St-Hubert and finally to Geoff's ( a MBC member, and president of Chambly and Terrace BC chapters) house in Chambly - a distance of about 40k. 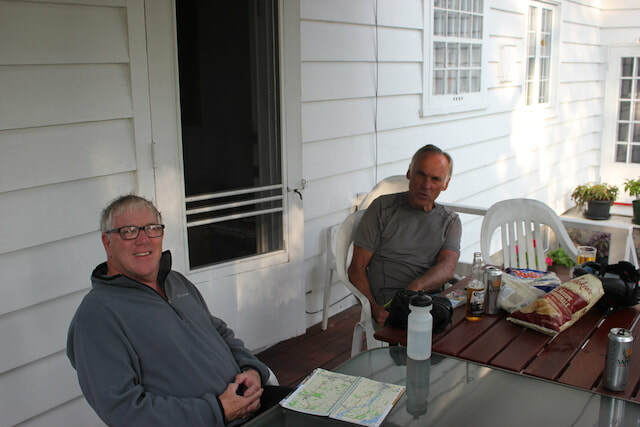 We dined with our host and slept comfortably in our own bedrooms and the three of us left Aug 31 for Granby on Route Verte 1 - pleasant, well-marked, mostly flat terrain. 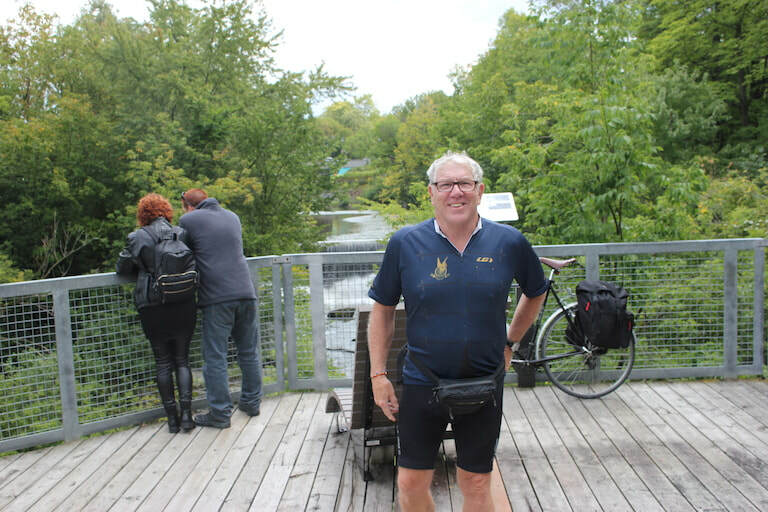 Geoff returned to Chambly to handle some chores whilst the Montreal Chapter continued on to Eastman (100k) where we lodged at La Marmotte B & B hostessed by Martine & Sylvie. We dined at a very fine local restaurant that evening and finished off with a shot of Cognac on account of it was the VP's birthday. On Sept 1 we had breakfast chez Matine & Sylvie and left at 9 am. This section was thru Parc Orford to Magogand was definitely more difficult gearing down frequently to 1-1 esp on the loose gravelly parts but this suffering was evened out by downhills where we reached max 55 kph. Generally well marked but occasionally I had to rely on the president's feel for the north star even in the daytime. If I had been on my own a search party would have to have been quickly dispatched. 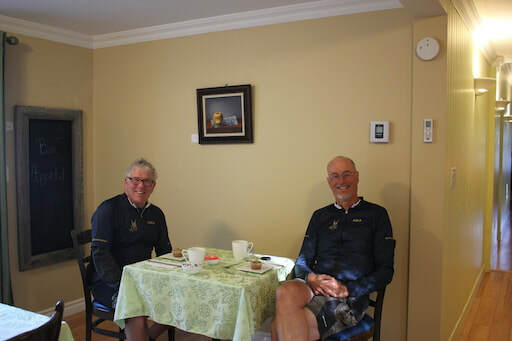 Magog to North Hatley was also toughish but we were rewarded by tea on the edge of lake Massawippi. 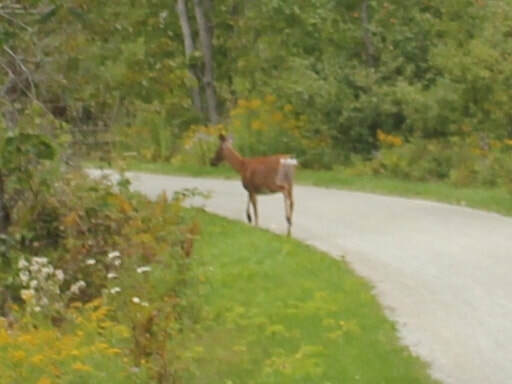 Thence on to Lennoxville (total 80k) on a flat hard packed dirt path where we encountered much non-hostile wildlife such as deer and other cute animals. 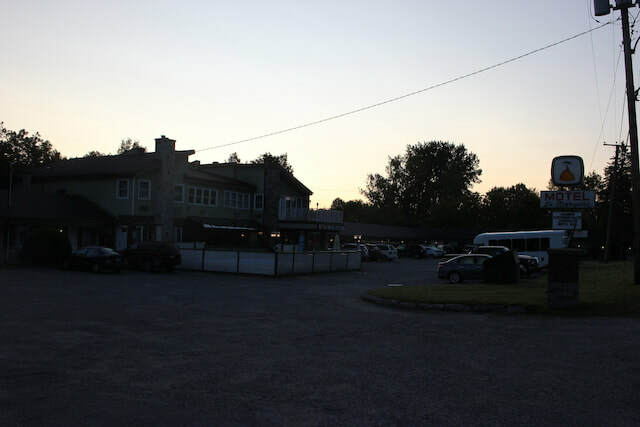 We stayed at La Marquise motel on the main drag and ate dinner at an Indian restaurant. Sept 2 Malcolm arose at 6 am on another beautiful day and headed to Victoriaville. 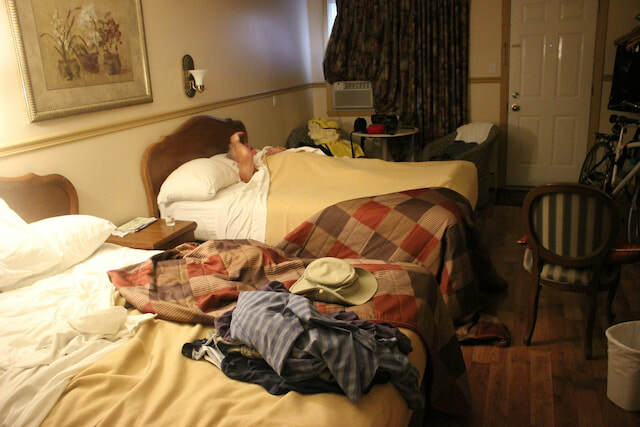 Ian stayed in bed then had breakfast at the motel (excellent) before ventured off to Bishop's University and then to BCS where he had done time as a youth. Both places were deserted as nothing was to begin until after Labor Day. Next stop for the vp was the bus station in Sherbrooke and a sunny ride back to Montreal. However, Sunday was not the same! - 7 degrees and raining. Latest news from Malcolm is "I'm 80 k from Quebec City". Better him than us! Total distance travelled by me about 250k. The send off and hosting by Geoff were greatly appreciated by Ian and I which made a marvellous start to the ride. Ian was obviously very excited about heading out. After arriving at Geoff's we had an in depth discussion about the upcoming trip. Rumor has it that Geoff was secretly preparing for our re-arrival a few days later. Geoff however kept our spirits up and made sure we were well caffeinated before parting ways. After Geoff's departure we made our way to Granby, here we stopped for lunch at a park. 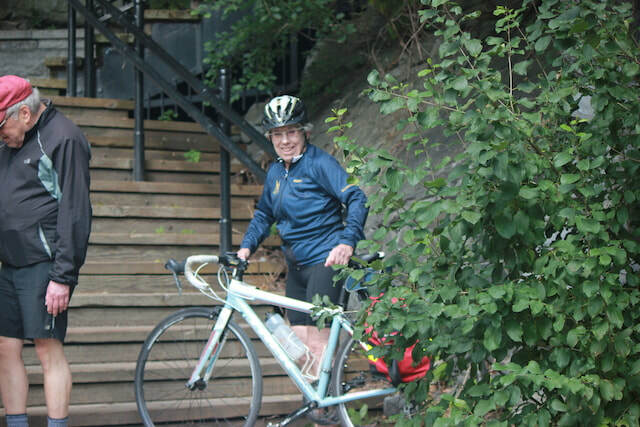 After our night at the B&B in Eastman, then another 100 km to Lennoxville, Ian seemed less than prepared for the next day's ride to Victoriaville. 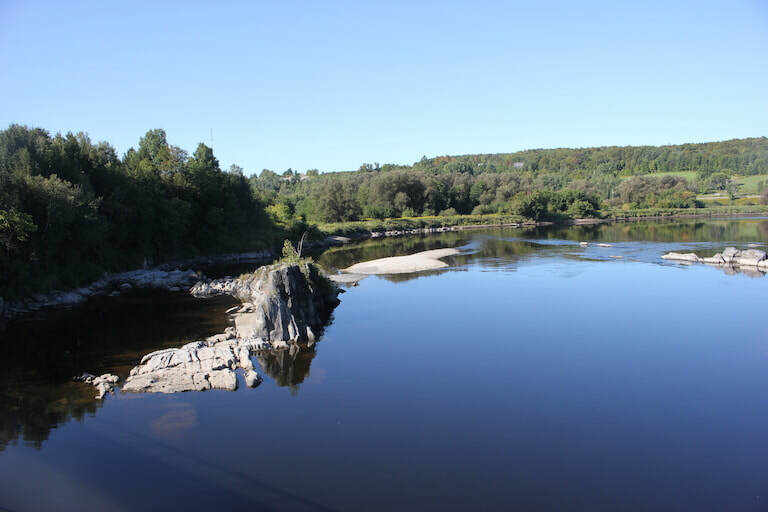 The Route Verte follows the Rivière Saint-François from Sherbrooke to Richmond and in my humble opinion provides the some of best scenery of any portion of the trip. 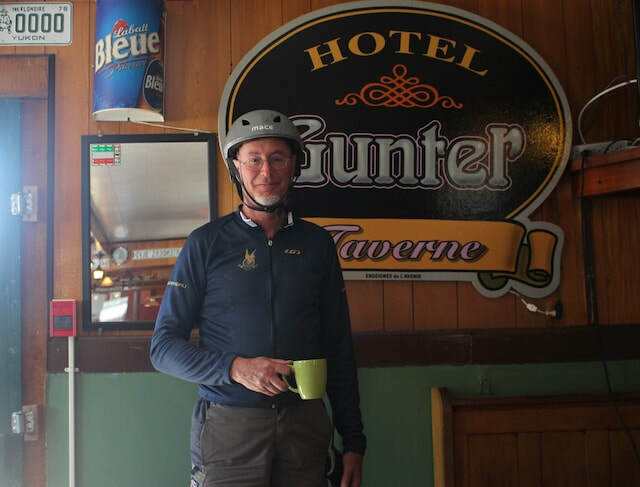 Richmond was the stopping point for lunch, and I was very fortunate to stumble upon the Hotel Gunter, it's unique decor, famous water wall, and charming hostess who took an interest in the Montreal Bicycle Club history. It is a venue I hope to bring a larger contingent of the club to again someday. 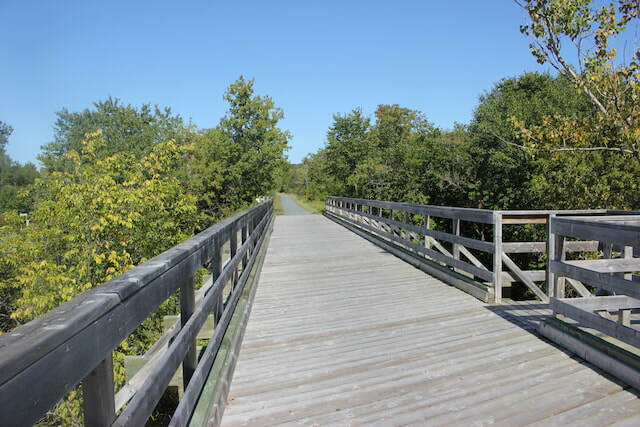 After Richmond the Route Verte follows the old Grand Trunk Railway line to Victoriaville and then [n to Levis. In general the surface is made with finely crushed stone in the country and asphalt within the actual towns. 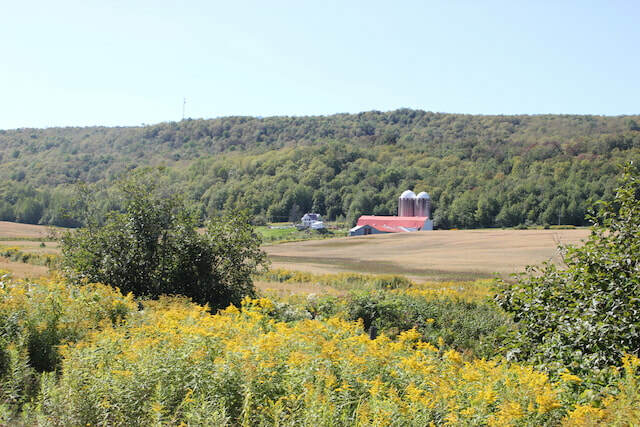 The scenery is of farmland, forest and bridges that cross the many rivers along the way. Victoriaville is the largest town between Richmond and Levis and I stayed at the Hotel "Z" that night. The arrival at Levis was rewarded with beautiful vistas of the St Lawrence and Quebec city beyond. The the trip ended with the ferry ride into Quebec city and a train ride home. 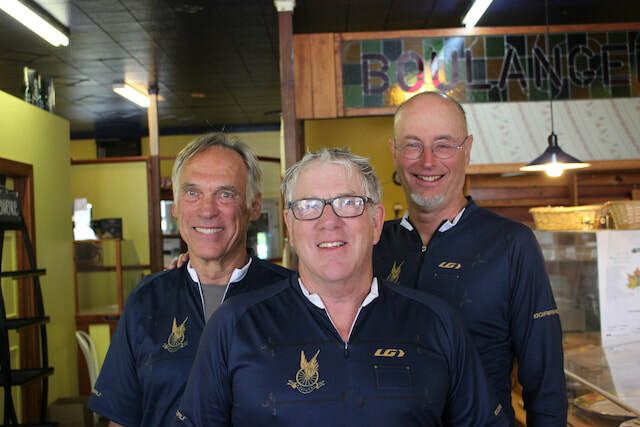 The club members gathered at the Shaikia cafe for the Wednesday morning pre-Ride coffee and croissant, of particular note, Annie Londonderry, took time from her globetrotting adventures to give congratulate Louis Louis and A.T. Lane on there success on the more modest Fixture ride. 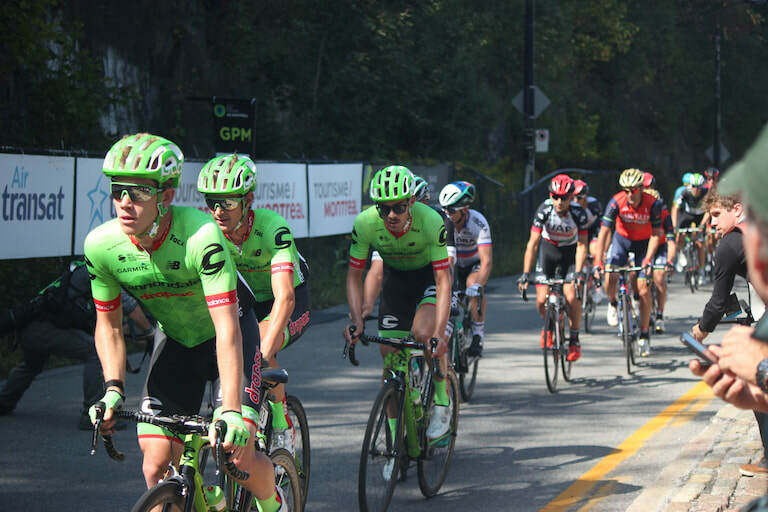 This recent Fixture ride to Quebec city was widely discussed and proposed that another ride on a different portion of the Route Verte be taken by the club at some time. A.T. Lane discussed the website of the Pickwick Bicycle Club , the world's oldest Bicycle Club. The club is part of a Dickensian Association and its members use sobriquets based upon characters from his novels. It was proposed that the Minutes of the Montreal Bicycle Club use sobriquets when referring to its members. They will be based upon cyclists from before the end to the Great War. The motion was adopted unanimously. 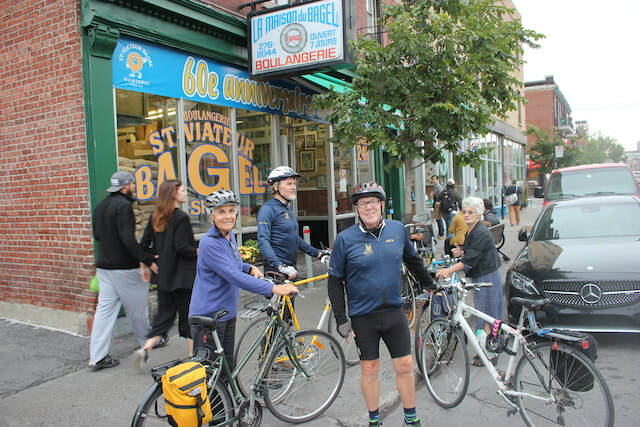 A relatively short ride was planned to the day, we went north from NDG into Cote Des Neiges, then along Cote Ste Catherine to St Viateur for a photo op into front of the Bagel store. 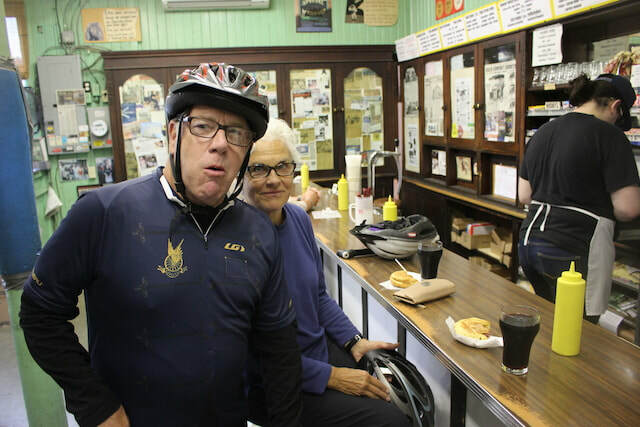 Louis Rubenstein insisted that we stop by at a famous Montreal Eatery for a light lunch. 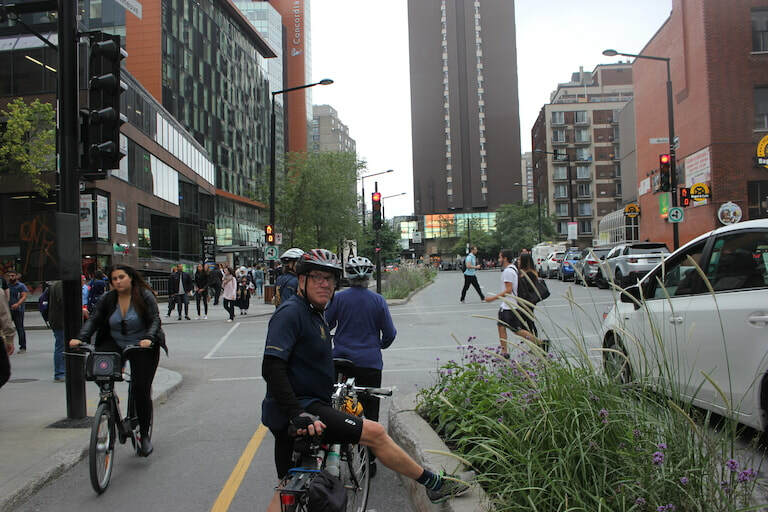 A quick stop at Velo Quebec to buy a Route Verte guidebook, then back through downtown Montreal passing McGill and Concordia. 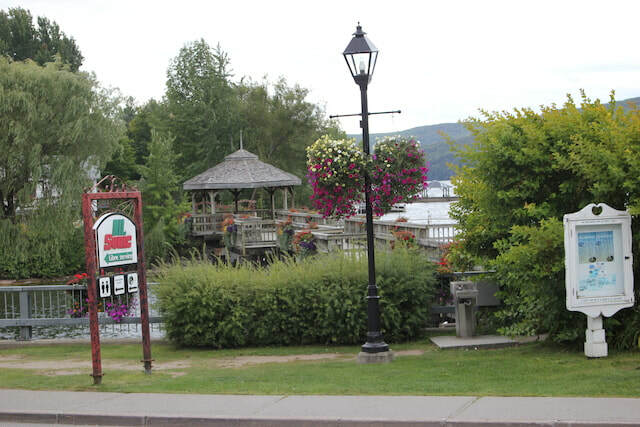 While passing through the downtown Daisy Greville departed the group early as she wanted to shop at La Baie. As A.T Lane will be away for the next two upcoming weeks, H.S. Tibbs, or Tibby as known to his friends will be in charge of organizing the upcoming Fixture rides. 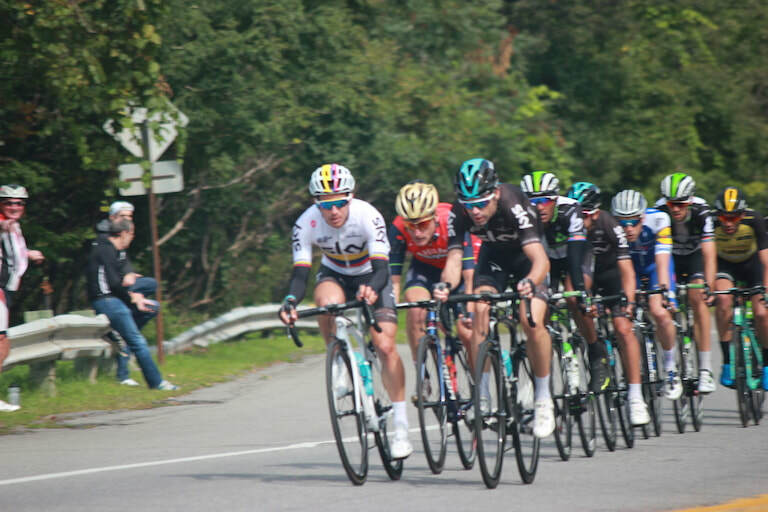 An 'impromptu' fixture ride was held by a few members Sunday the 10th of September in the Laurentians. 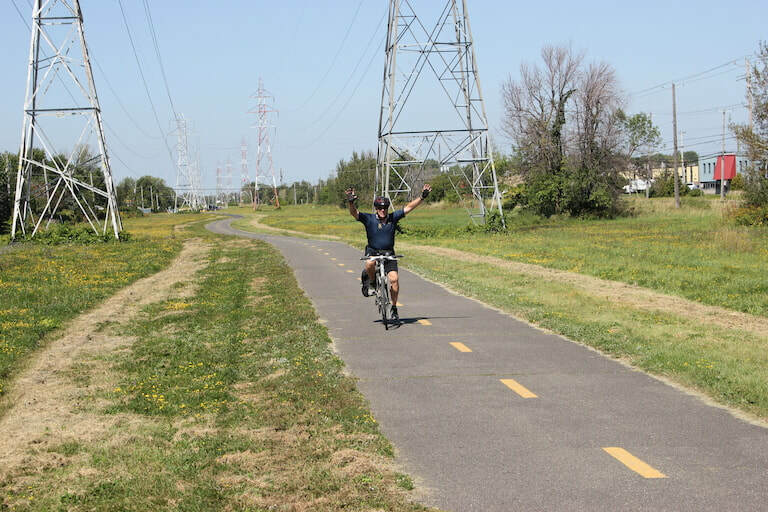 The ride convened at the church in Montfort and proceeded westwards along the former rail bed that has become the Aerobic Corridor pathway. 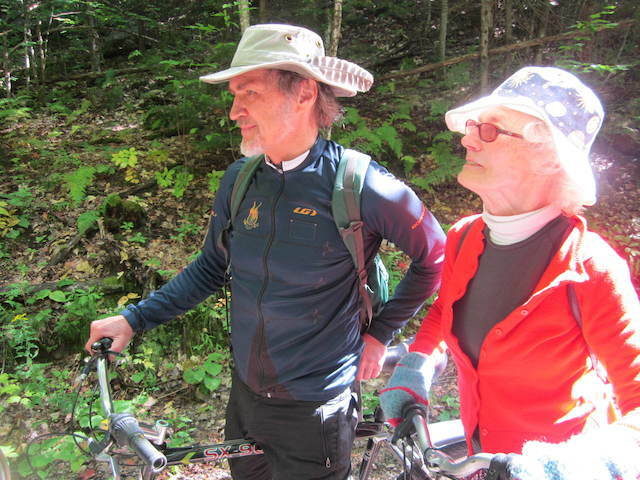 The cycled along lac St Francois Xavier and then upwards to the high point of the day in elevation. This was the cusp of a ridge below the summit that has the Orphelin hiking/ski trail. 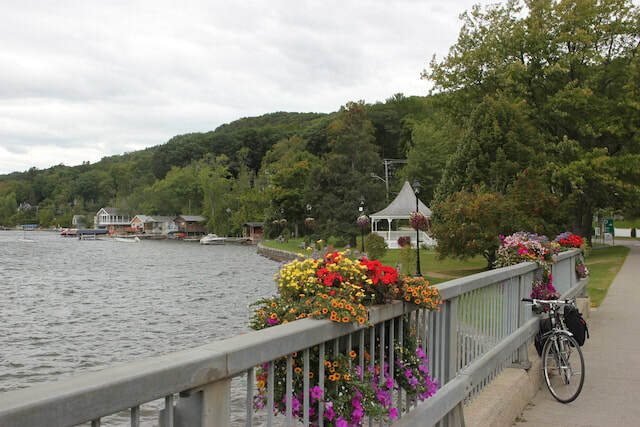 From there it was mostly a long gradual descent into the town on Lac des Seize Isles. The members cycled along many different lakes and dramatically at height above a few others. The route for the most part was in the woods. After refreshment at the local general store, the members headed back along the same route. It was more arduous but not difficult, having to ascend the altitude they enjoyed on the outward journey. On the return trip the members happened upon a vernissage of an art installation that spanned some trees on both sides of the Aerobic Corridor. The enjoyed conversation, a glass of sparkling apple juice, and homemade cake with the artist. A fine outing was had by all. 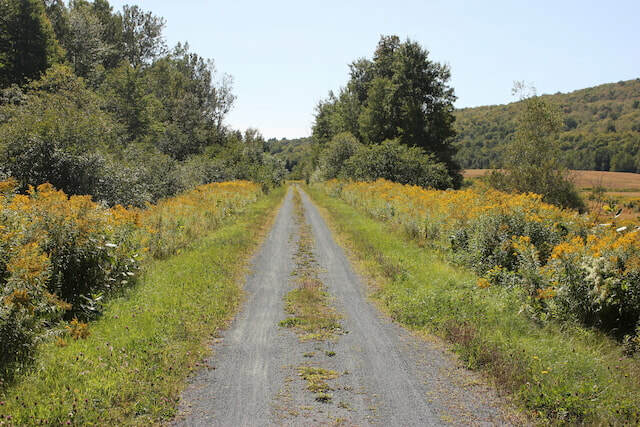 The trail was for the most part compacted earth, some gravel, and a few stretches of asphalt. Sunny weather, moderate temperatures, virtually no wind. Total distance approximately 26 kilometers. 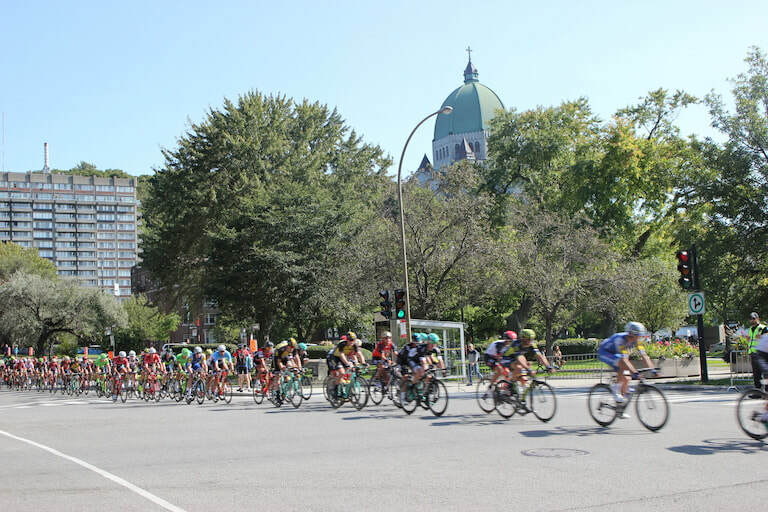 After meeting for coffee and croissant at the Shakia Cafe, Dorthy and A.T. bicycled up to the house of the latter in order to fit Dorthy with a new Montreal Bicycle Club uniform, (Light Long Sleeves variety), for viewing the races. 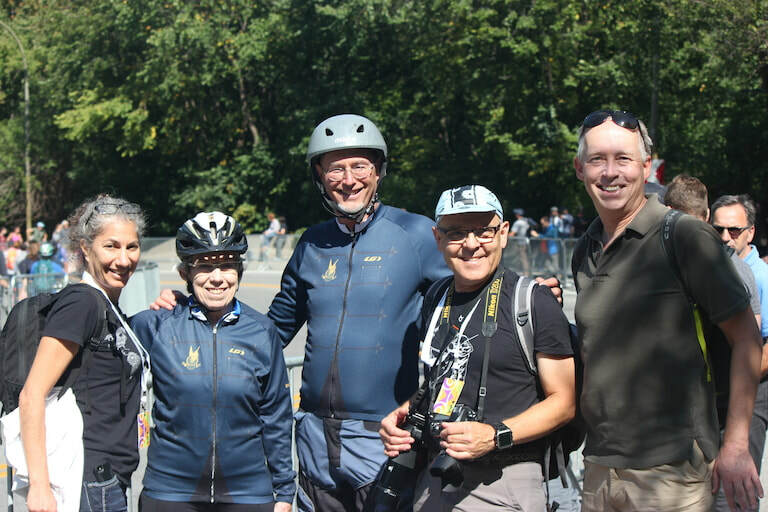 They struggled up to the top of Mount Royal then stopped to take photos of the racers who were moving counter current to their direction. 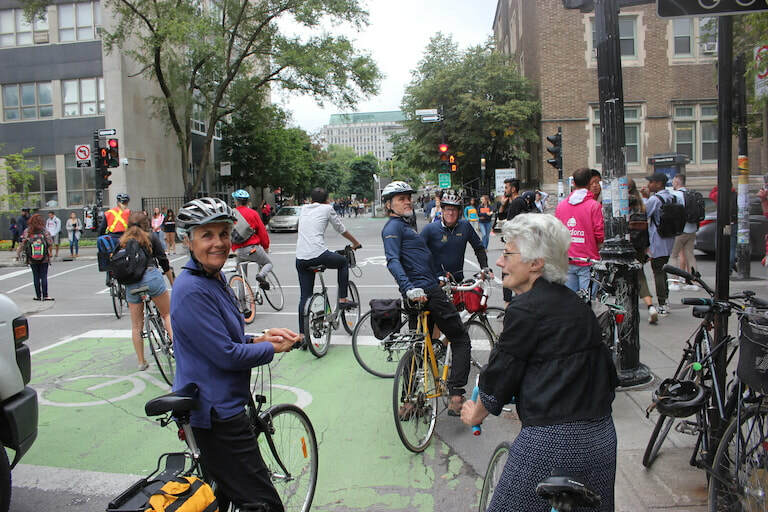 Dorothy Cole, being a famous and popular Montreal cyclist was known to many in the crowd and they had to pose for group photos as they searched out the best vantage points to view the race. 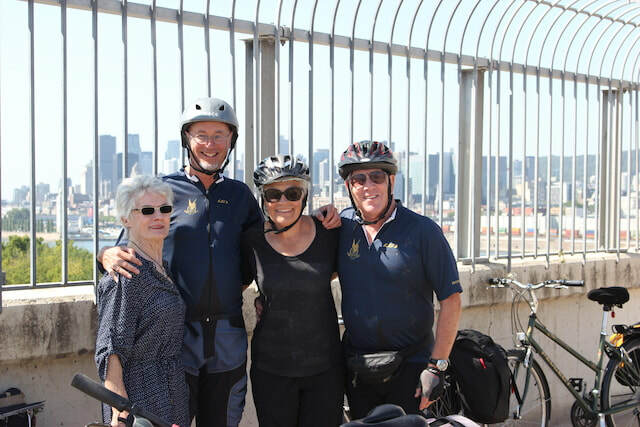 On reaching the far side of Mount Royal the club stopped for lunch. After lunch they cycled back along the northern edge of the race course, again taking pictures of the race from a variety of locations. 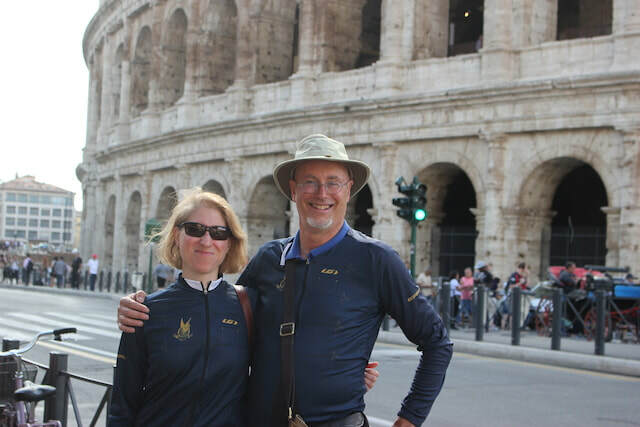 The Montreal Bicycle Club had an excursion to the Colosseum by some of its members. 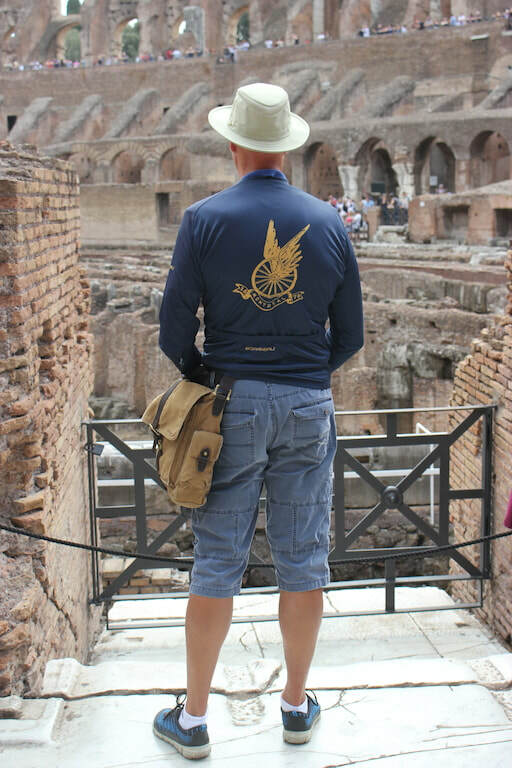 They had an excellent time viewing the ruins, and being seen. The meeting was called to order by the VP Ian Craig. (the by-laws quorum requirement of at least 1 rider be present being met). He noted the men were suitably attired in the club colors. Introductions were in order…as Marion Lennon aka Rowdy joined us today as a new member.. The meeting got under way about 10:15, We took the de Maisonneuve bike path from NDG, thru Westmount, into the Ville Marie boroughs..admiring the interesting architecture rising around the Quartier des Spectacles…turning north on Berri we crossed Sherbrooke turned left in order to take in the lovely La Fontaine park with its water fountains and beautifully treed landscaping. Following the bike path we admired the lovey walk ups in the Plateau and Rosemont Petite Patrie boroughs..These boroughs are known for their impressive array of bike paths..(to be avoided at bike rush hours)..the paths have the stop lights synchronized for a speed of 20 km/hr..plus they have installed interesting “cyclist comfort rests”—at the stop intersections..basically a very expensive hand rail and foot rest for bikers…I found the raised concrete curbs worked just as well..however. we dippy-doodled up Christophe-Colombe to the Claude Robillard Sports complex. 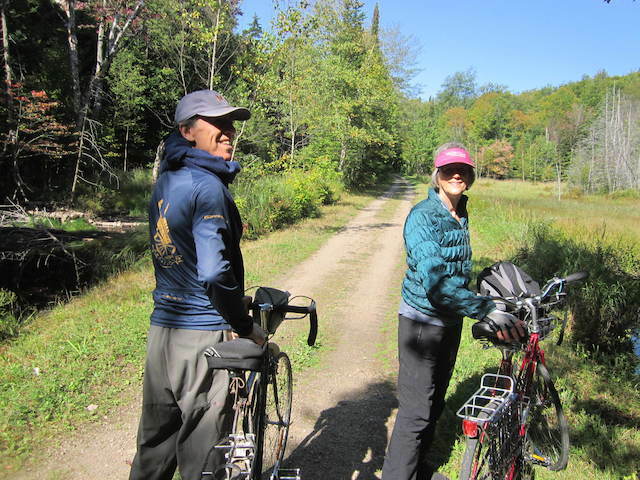 Then our adventure began..we turned east and found our destination site about 4 blocks over from Christophe-Colombe ….the site of the old Miron Limestone quarry..we basically circumnavigated the quarry. The quarry now known as the St-Michel Environmental Complex…comprises about 48 hectares (150 acres) with 5.5 km of bike paths..it is represented as the largest urban green space in the city surpassing Mount Royal in size..the area is not currently accessible as its conversion from a limestone quarry, to a landfill site, and finally a green space will not be finished until 2020…as we circumnavigated the complex we happened upon the campus of the Cirque de Soleil..apparently Rowdy interviewed there in the 1990”s for an overseas posting…an enthusiastic employee gave us a brief overview of the facility, 1500 employees who do the event design, the costume design, worldwide administration.. the campus has facilities to stage new shows in development, employee housing, set and costume design, read faculties for injured performers and is connected to the “gymnastic training school” next door. An impressive facility. 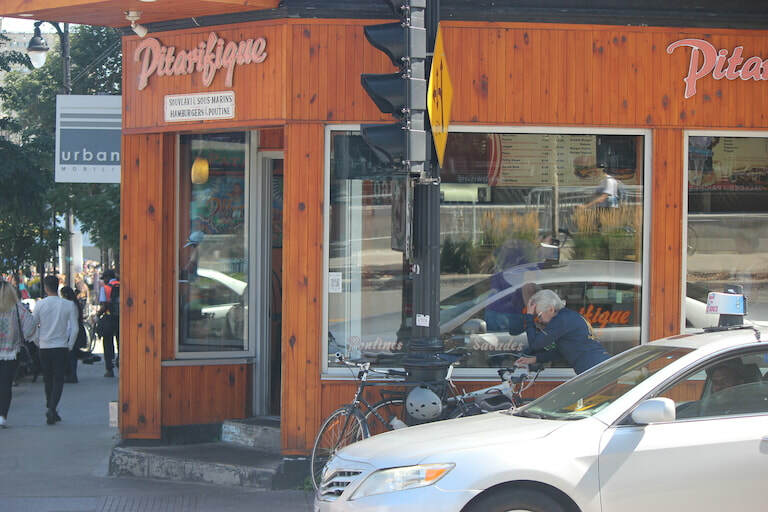 We decided to return to NDG by going north of the mountain working our way thru Outremont and HEC..following Edouard-Monpetit to Decarie…the team split up..with me going off to the Shaika cafe and my car via Monkland village..the others headed west finding their way home. all in all a good day.. The technical data for the day is as follows..